The third in our series exploring the archive of writing on photography from over thirty years of the Scottish Society for the History of Photography (SSHoP). This one, by Sara Stevenson, was published in 1990 in a special issue of the Scottish Photography Bulletin in honour of Murray Johnstone. 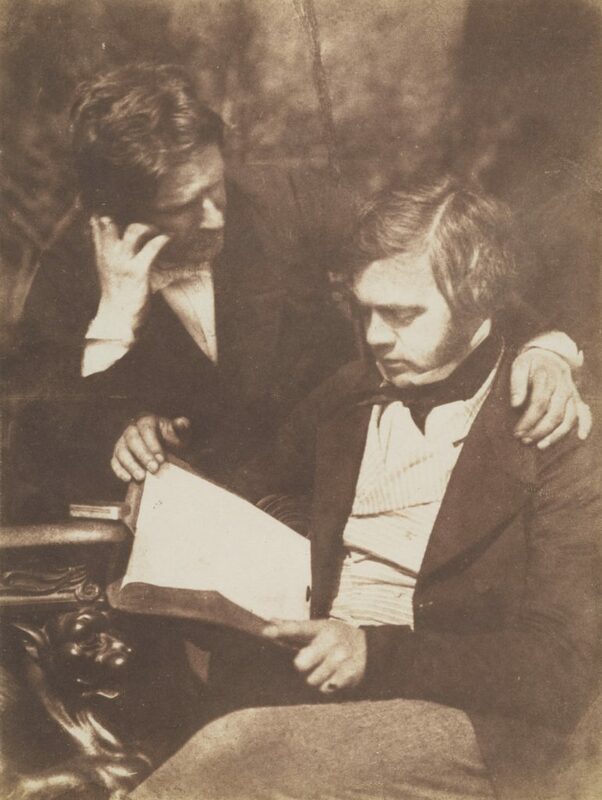 It concerns friendship and it’s importance to the calotypes made by David Octavius Hill and his partner and friend Robert Adamson. It is one of the curiosities of modern life in the West that friendship is seriously underestimated as a force. Affection sounds lukewarm and, sadly, even suspect to ears attuned to exaggerated passions. The expression of friendship between men is often driven into a perverse violence; in cowboy films, when two men attack each other in the saloon bar, to the cheerful sound of breaking glass and the maximum destruction of balsa-wood furniture, convention now decrees that we are not surprised when they then claim to be old friends. In the world of art we may fall into a similar, romantic trap – tragedy seems a more convincing driving force than wit, humour or affection. To say of a man that he was “kindly and genial” and “a most agreeable friend and companion”‘ has become peculiarly close to synonymous with saying that he is shallow and uninspired. We suspect that a man with sociable manners cannot be an artist. The artist, we feel, should be starving and friendless up in the garret, while the soulless philistine is cheerily stuffing his face with oysters and ale downstairs. With these mental clichés we have lost track of the way the world works. Passion, lust or anger, is a juvenile pursuit of absolutes; a projection of self that needs no knowledge of humanity and the world. It has the attractions of youth, its simplicity and beauty, but it is largely involuntary – it happens. Self-analysis serves no purpose in isolation; without outside reference, it feeds on itself and invents a world full of clones. By contrast, friendship is constructed by people attending to each other. It requires an efficient social education, flexibility and minor agreeable talents from the little joke to an interesting way with a pickled herring. Surely only through the concentrated outgoing attention inherent in friendship can we achieve the sympathy and subtle understanding that can see the skeleton in the body and the mind inside the head. 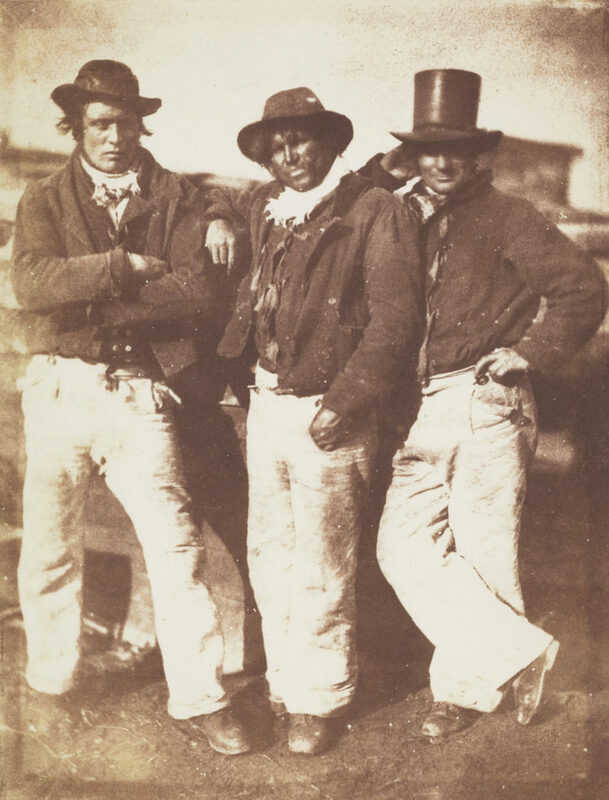 The social characteristics of friendship and affection inform and enliven the photographic work of David Octavius Hill. This is particularly obvious in his group photographs which show an understanding of social structure and the way people relate to each other physically, which is by no means easy to achieve when it is underpinned by the unnatural support of metal clamps to keep the pose steady. 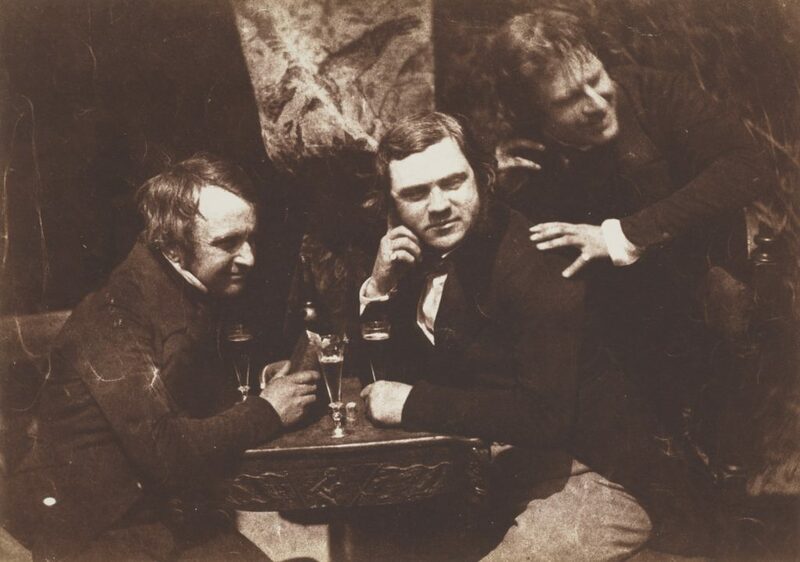 The degree of expression and the effect of conversation in photographs like Edinburgh Ale (above) and the group of D.O. Hill and Dr George Bell (below) is admirably convincing. It is art contriving the natural truth. The art circle in Edinburgh in the 1840s was admired by John Stuart Blackie for its “simplicity, naturalness, and want of affectation”.3 James Nasmyth, recalling an earlier time in a letter to Hill in 1856, talked of Alexander Nasmyth’s house at 47 York Place: “ah sirrah! them was the days for right pleasant songs, when old 47 was in its glory and Finnan Haddies, Ale of potency and most worshipfull toddy sent each its radiating aroma around and erected cracks worthy of being put in print … “4 This might, in itself, be taken as the text for the Edinburgh Ale photograph. Hill’s close friends regarded him with that edge of critical anxiety which is the concern of friendship. Letters to him contain half-jocular but heartfelt advice. Dr John Brown actually took up art criticism for the Witness newspaper, partly in order to address D.O. Hill: “I was anxious to do it very much on account of David Hill. I want to tell the truth about him to himself and the public … “7 John Stuart Blackie took the opposite view: “I loved him so much as a man, that his merits or defects as a painter seldom came within my view … I systematically avoided making curious criticisms on the productions of artists, that I might not attempt to combine the incompatible functions of a warm friend and a just critic.”‘ Both men felt it necessary to think carefully about Hill’s occasional failures as a painter, although their reactions were opposed. Though little known as a delineator of human character, he has many of the mental qualities proper to this department: he can throw himself out of himself, and be another; he has humour, which implies, we have always thought, not merely character in its owner, but a power of seeing into the character of others; and he has that thorough human-heartedness and love of his kind, that makes him lay out his affections on them wherever he sees them. We believe one great charm of his landscapes, – their tenderness, – is owing to this. On the occasions Hill referred to Robert Adamson in his correspondence, it was as his “friend”, as much as his “partner”. The remarkable and successful association between these two men, who discovered so much in the art of photography, was powered by this same force of affection. The truth of their work was based on the social qualities and profound knowledge of friendship that Hill brought to the partnership. Their art gives us a direct understanding and sympathy with the society in which they lived. It is a social art. 1. I trust there are regular feminist seminars in the United States on The Problem of John Wayne and What the American Male Should Do About It. 2. Said by James Nasmyth of David Octavius Hill, in Samuel Smiles (ed. ), James Nasmyth, Engineer. An Autobiography (London, 1891), p350. 3. A. Stodart-Walker (ed. ), Notes of a Life. By J.S. Blaikie (Edinburgh and London, 1910), p101. 4. James Nasmyth to D.O. Hill, 10 December 1856, ms letter in the collection of the Royal Scottish Academy. Nasmyth often wrote to Hill in this pseudo-medieval manner, which prompts the thought that the language of affection is particularly apt to “date”. The facetious and juvenile manner of writing often used between friends can be off-putting read in cold blood at a later date. It could be that this is one of the reasons friendship is underestimated. 6. Obituary of D.O. Hill, Edinburgh Evening Courant, 17 May 1870. 7. John Brown to John Taylor Brown, 10 March 1846, his son and D.W. Forrest (eds. ), Letters of Dr John Brown (London, 1907), p64. 8. Stodart-Walker, op. cit. , p102. 9. Dr John Brown, review of the Royal Scottish Academy exhibition, Witness, 22 April 1846. 10. David Octavius Hill to David Roberts, 14 March 1845, ms. in a private collection.